This week, Morning Consult released extensive polling on the favorability of senators and governors across the country-- every single one of them. You can imagine that the biggest take away for DWT is that Bernie remains the most popular senator in America and that Mitch McConnell remans the least popular. This is especially important to keep in mind as the corrupt establishment ramps up it's anti-Bernie campaign as the 2020 election comes into focus and the establishment coalesces around this cycle's version of Hillary (Biden or some other interchangeable corporatist shill). The anti-democratic socialism message-- directed towards Alexandria Ocasio-Cortez mercilessly (as well as towards Bernie, as usual)-- is getting louder and more virulent from the establishment of both worthless DC political parties and aimed especially towards Bernie's platform, usually using completely misleading GOP framing about not being able to "afford" anything good. There are some alarm bells here for conservative Democratic senators up for reelection. They are under attack-- despite their GOP-lite reelection strategies and voting records-- from the right and unloved on the left because of their GOP-lite reelection strategies and voting records. While many of the vulnerable Senate Democrats on the ballot in November have seen their popularity decline since the beginning of 2017, most of them remain more popular in their states than President Donald Trump. 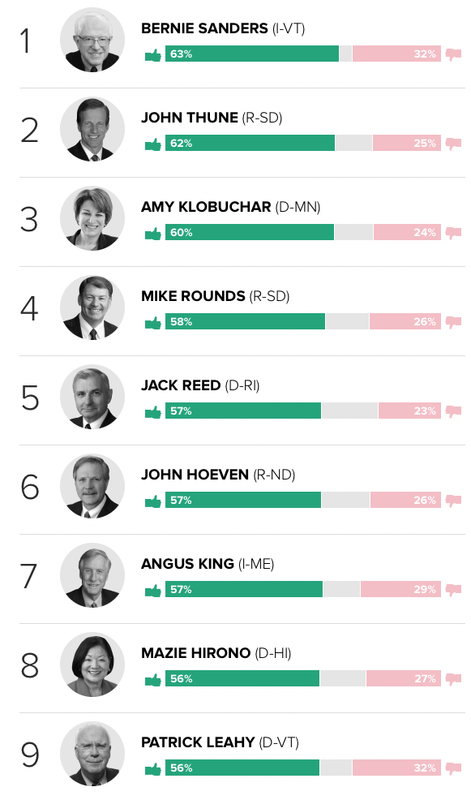 The latest edition of Morning Consult’s Senator Approval Rankings-- based on surveys with more than 330,000 registered voters from April 1 through June 30-- shows modest drops in net approval over the second quarter for three Democrats running for re-election in states Trump won during 2016: Sens. Jon Tester of Montana (-9 points), who has the support of half of the voters in the state, and Bill Nelson of Florida and Heidi Heitkamp of North Dakota (both -8 points), who were each backed by 44 percent of voters in their states. But that trio, along with five other Senate Democrats running in a Trump-won state this fall, still sport higher net approval ratings than the president. That’s a positive development ahead of a midterm election cycle, which often serves as a referendum on the president and benefits out-party members running for re-election. The last time an incumbent from the party not in control of the White House lost re-election was in 2002, when former Sen. Saxby Chambliss (R-GA) ousted Democrat Max Cleland. Trump has a better net approval than a Democratic incumbent in just two of the states he won during the 2016 election, Missouri and West Virginia. 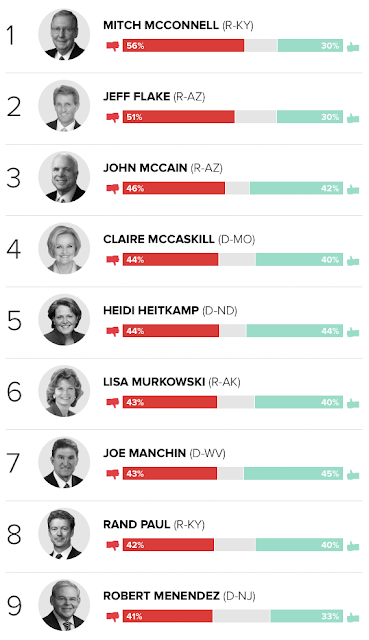 In the Show Me State, Trump’s net approval is 6 points higher than Democratic Sen. Claire McCaskill’s. The two-term incumbent is 1 point ahead of her opponent, state Attorney General Josh Hawley, according to an average of polls compiled by RealClearPolitics as of July 24. And in the Mountaineer State, Trump has a 20-point edge in popularity over Sen. Joe Manchin, the most conservative member of the Senate Democratic Caucus; however, Manchin leads his challenger, state Attorney General Patrick Morrisey by 7 points on average, according to RealClearPolitics as of July 24. Sen. Dean Heller, the lone Republican incumbent running for re-election in a state carried by 2016 Democratic nominee Hillary Clinton, remains 3 points underwater and saw no change in sentiment among Nevadans since the first quarter. In governor- world it's a different story. The whole top 10 are Republicans, including 3-- Charlie Baker (R-MA), Larry Hogan (R-MD) and Chris Sununu (R-NH)-- in pretty Democratic states. #10 is the odious Greg Abbott of Texas. Two other Republicans, Mary Fallin of Oklahoma and Matt Bevin of Kentucky, also suffered bruising quarters. [Oklahoma's Mary] Fallin, now the most unpopular governor in the country, saw her net approval decline 17 points as she approaches the end of her second, and last, term. In the second quarter, 19 percent of registered voters in Oklahoma backed her job performance and 74 percent disapproved. Her declining fortunes with Sooner State voters came amid a high-profile teachers’ strike, which began on April 2 and made national headlines before ending nine days later. Her struggles were enough to lift Democrat Dan Malloy of Connecticut out of the bottom spot-- although, at 71 percent disapproval, he remains the second-least popular governor by 11 points. Teachers’ protests also brought political pain to Bevin. 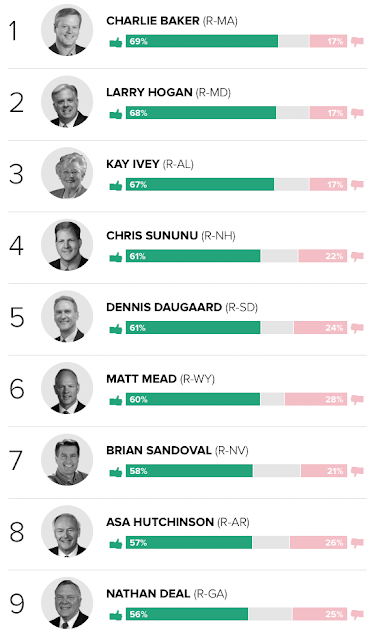 The first-term governor finds himself back in the bottom 10 of the rankings for the first time since Morning Consult released its inaugural version in May 2016. Fifty-seven percent of Kentucky voters said they disapproved of his job performance during the second quarter, compared with 29 percent who backed him, a 25-point net dip from the previous quarter. Morning Consult data shows voters were already souring on Bevin when on April 13 he levied the charge that children had been sexually assaulted or physically harmed due to being left alone while their teachers protest. Following the remarks, which Bevin apologized for two days later, the share of Kentucky voters who strongly disapproved of him spiked. The governor has also faced a rocky road since then, including opposition from advocates for the poor to his plan to enforce work requirements as part of the state’s Medicaid program. That NBC-Marist poll we've been referencing all day, shows Wisconsin governor Scott Walker trails state schools superintendent Tony Evers, the likely Democratic nominee, 54-41% among registered voters. In Michigan, Democrat Gretchen Whitmer, the former minority leader in the state Senate, leads likely Republican nominee Bill Schuette 47-38%. And in Minnesota the likely Republican nominee, Tim Pawlenty trails either of the likely Democratic nominees, Lori Swanson or Tim Walz by identical numbers-- 51% to 40%. Let's hope there is more than a blue wave. A tsunami is needed. Anti Trump should be an important part of any Dem's platform. Speak up loudly! He is clearly a TRAITOR. The findings are rolling in. The time line, clear from Trump's own words and actions documented on video and in print, are there for anyone to see. Only a moron won't see it - the deplorables, naturally. They have been so conned by Don. They and the Republican party are going to be hugely embarrassed and have their comeuppance, supporting a persistent liar, traitor, criminal and woman hater like him. The numbers listed in support of so many are pathetic. Too many are in the neighborhood of 50%, which a rotten cantaloupe can achieve on a cold day. Around 25% are too ignorant to live outside of a civilized society and another 25% are just holding their noses since there are no better options. Only 3 rise to 60% or above, ad both parties don't want to know why as they would have to make deep changes and disappoint their owners to have more 60% approvals. It's not looking good for the future of this nation. Corruption is too widespread and embedded. Again, perhaps more than any other, this polling just proves that americans are so stupid we cannot possibly know we are alive. It simply reflects the brain-dead, tribal partisanship of the electorate. the future of this "nation" is ugly, short and probably violent. Stupid tribes usually die off quicker. Midnight Meme Of The Day! 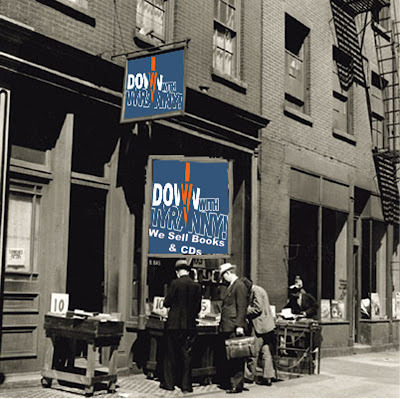 Visit the DownWithTyranny Book & Music Store!